In May 2011, Port of Odense took delivery of a new Liebherr mobile harbor crane, type LHM 550. With a total height of 74 meters, the crane is more than twice as high as the famous Round Tower in Copenhagen. The LHM 550 was designed to lift up to 150 tons in hook operation and to handle all types of general cargo, containers and bulk commodities. 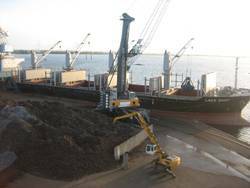 Operations take place at Odense Port Terminal at Lindø, which is one of Denmark’s most central transport areas for heavy and voluminous cargo. The crane, equipped with a Pactronic® hybrid drive system, has now passed the trial period and demonstrated that substantial benefits for the port could be achieved.